On virtual tour, that is. August 1, 2012 is the American publication date for Emily For Real, and Sylvia is going to spend the month of August talking about it on blogs throughout Canada and the United States. For updates of the appearances as they happen, follow our blog at www.pajamapartybooks.com, or Like us on Facebook. Congratulations, Sylvia! We can’t wait to see what you have in store! This summer we’re having a virtual party with our favourite funny friends from Don’t Laugh at Giraffe! We’ve already given you some game ideas; today we’ll be sharing an activity that lets kids get in on the fun of making their own loot bags! Press your hand into the yellow paint. 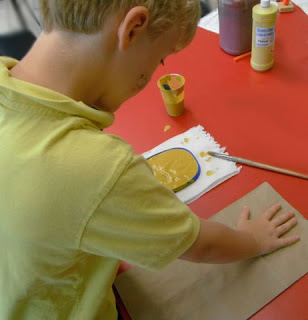 Press your painted hand onto the paper bag. 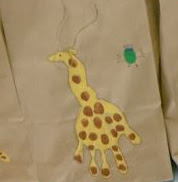 Dip your finger in the brown pain and give your giraffe spots. 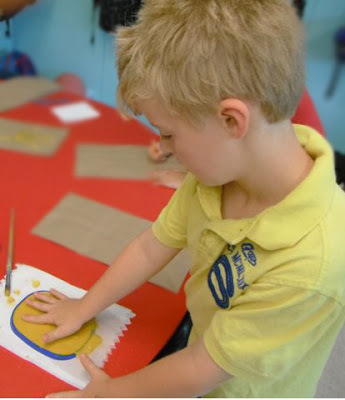 One the paint is dry, add details with a pencil crayon or marker. 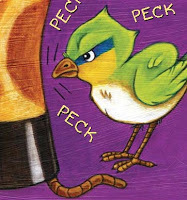 You can make a thumbprint bird using the same technique! Stay tuned for even more fun with Giraffe and Bird! I just got this FABULOUS book from the library yesterday. It’s called No Shelter Here. I LOVE IT! It’s very sad knowing what things are happening to dogs, but it just reminds you to give your dog extra love. It also tells you about great websites to visit that have to do with Animal Welfare and Shelter Dogs. With each dog problem it tells you about, there’s one story of someone who helps make the world a better place for dogs. Thank you, Rob Laidlaw, for making the world a better place for dogs. Click here to see Lili’s full post. Last Airlift: A Vietnamese Orphan’s Rescue from War tells the story of one orphan, Tuyet, who was airlifted from Saigon (now Hồ Chí Minh City) at the close of the Vietnam War and adopted into a new family in Canada. Today we are sharing an interview with another orphan, also named Tuyết,who came to Canada in the same dramatic way and who has a story of her own. How old were you when you left Vietnam? Although my parents were told, verbally (so they say), that I was born December 7, 1968, unfortunately, none of my paperwork shows that date. In actual fact, all my paperwork had been prepared one year before I left Vietnam, indicating that I was born December 7, 1969. You must remember that although I was given this birthdate, and I stress “given”, this is not necessarily my birthdate. During the time of war, many children found in the most awful places you can imagine, left to die, were taken to the orphanages with no paperwork on them. And those children who were in orphanages, whose lives could not be saved whether through diseases, malnutrition and/or already existing birth defects, who died, their birthdates would have been used for those who were going to be adopted by families around the world. So, to answer your question, I’m not really sure how old I was when I left Vietnam—possibly 5 or 6 years old. What do you know about your life before you came to Canada? There’s not much really that I can recall about my life in Vietnam before coming to Canada. It was not indicated on my paperwork which orphanage I was at or if I ever was—but obviously I was, because my paperwork was prepared. I must have been somewhere. There are times when I am doing something and I get flashbacks, like having been piggy-backed either to school or church, or having been given something by one of the soldiers who came to visit at the orphanage. My mother has said to me at some point (I must have told her at one time) I remember sitting on a soldier’s knee and having a great time—he must have been pretending to give me rides or something—I don’t recall that, but I guess that’s what I told her. What do you remember about the journey? Not much. However, I do recall that I was placed beside another girl, either in a van on the way to the airport or on the plane. I think her name was also Tuyết. I think she was a little older than me. Did you know these things while you were growing up, or did you have to do research later to discover your history? 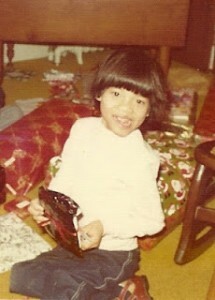 I had known as a child that I was adopted and that I had come all the way from Vietnam. My parents had always been supportive in trying to show me a lot of pictures from Vietnam, or television shows or movies that had anything to do with Vietnam. They had spoken of the Vietnam War and that I was probably found by someone on the streets, probably left to die, and was taken to an orphanage. My mother even made my Áo dài (Vietnamese traditional dress), once every two or three years right up until I finished college. I did do a bit more research later on when I grew older, and when I was more interested and could understand better the history of the Vietnam War. When did your adoptive parents know that they would be adopting you? My parents didn’t know they were going to adopt me. They had at first looked to adopt a boy and a girl from the same orphanage who left before me. Unfortunately, the plane (C-5A Galaxy) they were taking out of Vietnam on April 4, 1975, crashed within 10 or 15 minutes of being up in the air. The plane lost control and crashed into the rice paddies below. Everyone in the lower compartment of the plane died, and that included the girl my parents were looking to adopt. The boy, however, survived the plane crash and was sent the next day, on another plane that arrived in Montreal. My parents were still looking to adopt a girl, at which time they heard about me. What was it like to travel back to Vietnam? I made a return trip to Vietnam in March/April of 2010. I was 39 years old. I felt I needed to make at least one trip back, in my life, to my homeland to see how much of it has changed and to see if there was anything I could remember of it. Overall, there were some great highlights to my trip (and some not so great) and I learned so much, but the whole experience was an exercise to see if I could still have fit in with the culture. Everywhere I went, each of my tour guides explained to the curious local people, when they found out that I couldn’t understand their language, let alone a greeting, that I had been adopted into a Canadian family from a very young age. That, I found, in itself, set me apart from the people who were part of my history. I didn’t feel that I had that sense of belonging. There were no memories in any place that I travelled to that I could pinpoint any sense of familiarity. But then again, how would I know? I was in an orphanage for my whole life there. I had lost that aura of being a Vietnamese. Are there still unanswered questions that bother you about your past and about the war? What are they? For the rest of my life, there will always be questions about my past—although it’s always great to tell people, “I don’t know who I really am”. There will always be questions of, “Who were my parents?” “Are they still alive?” “Where are they now?” “When and where was I born?” “Why was I given up to either be left to die or to be saved and adopted?” “What were my biological parents’ thoughts during the time of war?” “What is my family background?” “What medical history should I know about?” For now, it would seem that all of these questions will remain buried in the past. For information about Operation Babylift, a similar initiative in the United States, visit www.vietnambabylift.org. 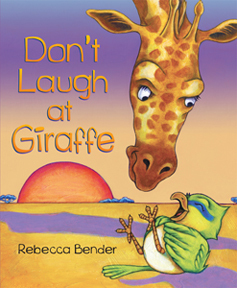 Giraffe and Bird are unlikely companions, but their antics in Rebecca Bender’s Giraffe and Bird and Don’t Laugh at Giraffe have charmed children, teachers and parents across the country. 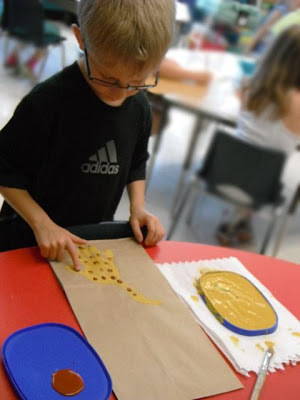 For those who just can’t get enough, we’re building a virtual Giraffe and Bird party, complete with games, food, crafts, and favours—each one of them healthy, wholesome, and kid-tested. Over the course of the summer we’ll be bringing you step-by-step instructions so that you can have your own party! And don’t forget to share any fun ideas of your own in the comments. We can’t wait to hear from you! The straw goes in the glass of water. 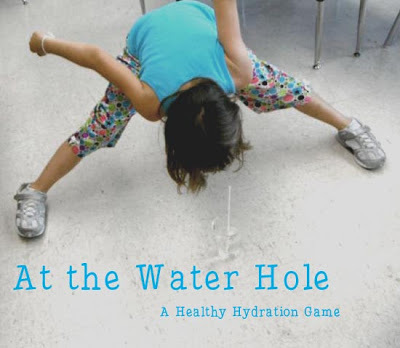 The glass of water goes on the ground. Be the first to drink a whole glass of water. No bending your arms or legs! Make a hole in each apple slice with the paring knife and feed a length of string through. Appoint half of the children as “trees” for the first round and half as “giraffes”. They can switch afterward. Give each “tree” a leaf to dangle. 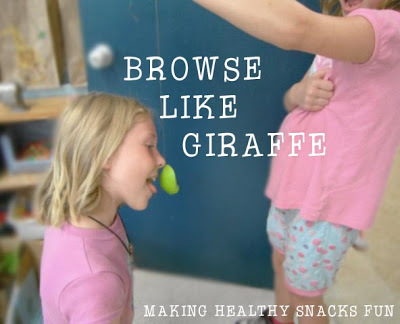 Just like Giraffe when he’s browsing for leaves, eat your apple slice without using your hands! If you’re preparing your apple slices ahead of time, let them sit in lemon juice to keep them from browning. Bird HATES it when Giraffe steps on an earthworm. It means the worm will be stretched all out of shape by the time Bird pulls it free. 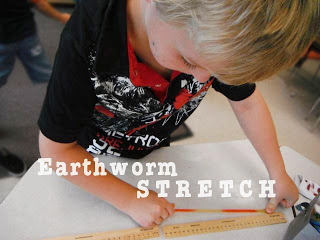 How long will the worm stretch? Find out! To have the most stretched-out gummy worm in the group! Check your results with a ruler. 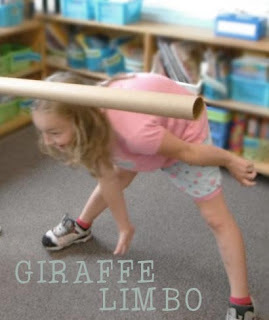 This is just like regular limbo, except instead of bending backward, you’re bending forward! Don’t forget to keep those front hooves hands off the ground! 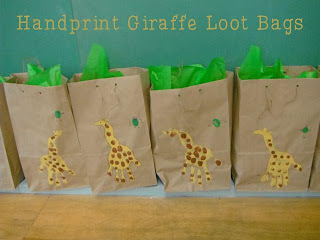 Stay Tuned for food, craft, and favour ideas for your Giraffe and Bird party! Rob Laidlaw, long-time animal advocate and international champion of dogs, provides information about the challenges dogs face around the world. With examples from Canada, Japan, India, and several other countries in addition to the United States, he exposes the plight of these abandoned and often abused animals. Urging readers to get involved, he relates the stories of children and young people around the globe who saw a problem and became Dog Champions. Kids have created documentaries, raised money, and helped to make lawmakers aware of dog abuse. 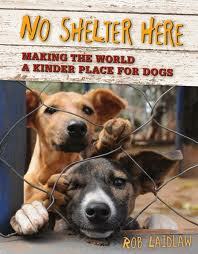 This book is great for reluctant readers, dog lovers, or kids who need to do a service project. …Gunnery nicely captures the way families really are, the sweet, mundane and strained interactions of everyday life. Emily for Real is a satisfying read for teens who will root for Emily as she faces the challenges of friendship and families and growing up.